Employing the same informational approach Erik Seedhouse used in "SpaceX" and "Bigelow Aerospace", this new book familiarizes space enthusiasts with the company XCOR Aerospace and examines the design of the two-seater Lynx. The new spaceplane's low weight and high octane fuel confer important advantages, such as direct runway launches and the ability to fly several times per day. Over the last 15 years, XCOR has developed and built 13 different rocket engines, built and flown two manned rocket-powered aircraft and has accumulated over 4,000 engine firings and nearly 500 minutes of run time on their engines. This book serves as a go-to reference guide for suborbital scientists and those seeking to learn how one company has found success. Additionally, it describes the medical and training requirements for those flying on board the Lynx and the related critical roles of the astronaut trainers and a new breed of commercial space pilots. The end result is a thorough chronicle of the development of rocket propulsion, avionics, simulator and ground support operations being put into play by XCOR with the Lynx. 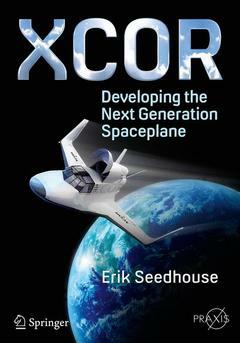 XCOR: The Company.- Personnel.- Industry.- Next Generation Spacecraft.- Spaceports.- Missions.- STEM.- How to Fly. Seedhouse is a research scientist specializing in environmental life sciences and physiology, the subject in which he obtained his Ph.D. while working for the European Space Agency between 1996 and 1998. In 2009, he was one of the final candidates for selection as an astronaut in the CSA’s Astronaut Recruitment Campaign. He is a certified commercial suborbital astronaut who will fly a payload mission in 2015/2016. Between 2008-2013 he was Director of Canada's Manned Centrifuge and Hypobaric Chamber Operations. He is also the Training Director for Astronauts for Hire. He works as manned spaceflight consultant, triathlon coach, author and public speaker.